If you haven’t seen Dr. Susan Garlinghouse speak – you should take advantage of any opportunity to do so. She is at least as hilarious in person as she is on her website. At one point she called us a “tacky” crowd (which is apparently synomonous with “endurance”) and then mentioned that this being an endurance convention, she has probably seen most of us pee in the bushes and vice versa. Oh too true, too true. And sometimes there aren’t even bushes. The point of the seminar was Hydration of the endurance horse and cummulated with some electrolyte advice. One point that was reiterated over and over and over was that there are long term effects on a horse. Think of the horse as a rubber band – you can stretch it repeatedly, but it produces micro damage that can accumulate and eventually lead to failure, OR you can stretch it REALLY far a couple of times, and then lead to failure. Horses are NOT 100% when they cross the finish line and we can not pretend it is. Going 100 miles or even 50 miles takes a certain toll on a horse – whether it is conditioned and not – and this seminar covered dehydration specifically. The bottom line is that EVERY horse needs consideration for it’s hydration and other physical needs after it crosses the finish line and in the hours and days afterwards. Just because you got that completion, or received all As at the finish doesn’t mean that your horse is as “good” as it came out of the pasture (in terms of hydration etc.). Having your horse’s head to one side can affect the skin pinch test done during the vet checks. This was interesting because I think I’m very guilty of having the horse’s head tipped in towards the vet during the vet check, and I often get marked down for skin pinches, even when the rest of the parameters look good. Difference between tolerable dehydration and treatment is 2-3 gallons of water. The difference between tolerable dehydration and “about to die” is 8 gallons of water. Trailering loss is 0.8 gal per hour, 1% dehydrated per 90 min travel. Thus, 8 hour trip produces a horse that is 5% dedicated upon arrival (6.25 gallons low). Another point that was addressed was the people that say “my horse will drink what it needs”, or “when it’s thirsty it will drink”. Actually, although the second statement may be true, depending on how you offer water, the first is definitely NOT true. Horses only voluntarily replace only about 2/3 of fluid deficit by drinking during the ride. Part of managing hydration of the endurance horse is getting that figure as close to 100% as possible. -If at all possible, bring familiar water. At least for that first night. -Provide BIG buckets. Horses will drink out of large buckets better, and keep the water level up so that they don’t have dip into the bucket below eye level. The difference between having a large bucket versus a small bucket is the difference between being at the airport and only having a water fountain, versus a water bottle. Muck buckets are ideal for water buckets at rides. Clean is a must. -Alfalfa. Although we were told in an earlier seminar (nutrition) about some of the problems with an alfalfa diet in terms of calcium and ammonia production/secretion, I didn’t connect the dots about a diet high in alfalfa impacting hydration until this seminar. High protein (alfalfa diets) need more water in order to excrete the excess protein. Horses fed a normal diet high in alfalfa are already at a disadvantage when it comes to hydration because of their need of additional water. -The older horse has less fluid in their body than when they were younger, so the older horse is closer to the edge of dehydration than when he was younger. Always try to feed wet foods – hay if possible. Never feed dry pellets. OK – back to the numbers! At 3% dehydration there is a 10% decrease in muscle strength, 8% decrease in muscle speed. How does this effect endurance horses? Think about a horse that is presented as tired, and stumbling. Do you think that it could be related to a decrease in muscle strength due to a very low level of dehydration? (remember – we can’t detect below 5% without a blood analysis!). Why do we care about muscle speed? Think of a tired horse that is tripping – do you want them to recover their footing quickly, so that you don’t need to check out the ground in an intimate fashion? Does any one still think that low levels of dehydration still doesn’t impact their horse’s endurance performance? Garlinghouse mentioned that dehydration will show up as lameness because the horses are going to be fatigued, stumble, hurt something etc. So why don’t horses replace the fluid they are losing? Horses have a lag of thirst response and an “apparent tolerance” for thirst in the horse (i.e. they are more tolerant of being thirsty than we are). One mechanism that was explained in the seminar is that horse sweat is the same saltiness as the blood…..so while the overall blood volume is less as the horse becomes dehydrated, the saltiness level of the blood doesn’t change that fast. This can be compared to humans – whose blood gets saltier as they lose fluid. The little receptors that trigger the thirst response detect the change in this saltiness. Thus the response in the horse is slower and less selective. The adage of “don’t wait to drink until you are thirst because then you are dehydrated” is even more true in the horse than in the human. Presence of water in the mouth and esophagus shuts down the thirst response. I am familiar with this concept, which is why I’m adamant about not pushing other horses off the tanks or letting someone else do so to me. I will hang back and let my horse stand while waiting for a hole at the water trough, and then once I’m there, I am adamant about not letting other riders let their mounts say “hello” or do anything else that might cause my horse to stop drinking. I’m polite but firm. If you allow your horse to be pushed off the water or stop to drink to say hello to someone (which is just bad disease control as well….) your horse will drink less. Considering that under ideal circumstances your horse already will NOT replace fluid he is losing, this is probably less than ideal…..don’t do it to others, don’t let it happen to you. Better to wait 5 minutes until there’s less people at the trough than to “get in the thick of it”. Garlinghouse’s suggestion was to let the horse;s mouth go dry – don’t use your water bottle to squirt water into the horses mouth, or drink out of small puddles. These sources provide the horse with minimal water that won’t significantly replace his losses. Better to not let him get his mouth wet (and thus shutting down his thirst response), and let him drink at a source where he can “drink his fill”. In one study, aggressively elyting horses at a 36 mile ride caused them to voluntary replaced more of their fluid losses than the horses that were not elyted. Electrolyting causes the blood to get saltier (thus increasing thirst response) BUT electrolyzing is not without its risks. Some of the horses that were aggressively elyted had blood work with too high NaCl. Recommendation: don’t try to replace ALL the horse’s elyte losses during ride – only a portion. This study tried to replace 50% of elyte losses, they recommend replacing 1/3 of losses in practical application. Example of what that actually MEANS: Average loss of 2 oz per hour in ambient conditions. 4 oz in extremes conditions. .6-1 oz per hour of exercise. 51/2 to 8 oz in an average 50 mile ride. -Smaller doses work better for horses that stop eating on larger doses. -Elyte when watering, or even earlier than the water in the early part of the ride. Do what you can. Try to do more often than just at the vet check. -Lots of problems to try and replace all electrolytes so don’t try to do that. You can get arrhythmias by elyte too heavily. -Don’t give elytes to a horse that’s already dehydrated and should be drinking and isnt. Can make problems worse. Example: your horse doesn’t usually drink on the first 10 mile loop, but is usually drinking by mile 20. When he isn’t drinking at mile 30 is NOT the time to start elyting. Some cool trailering tips to minimize the dehydration effects described earlier: elyte before departure (Can give a huge big load here since you know he isn’t dehydrated), and hang tub of sloppy mash in trailer that is high value. Mash should have milk shake consistency. Soak soak soak and then add some more water. Horse can consume a couple gallons this way and is MUCH better than having them eat dry hay in the trailer…..obviously need to get horse used to eating milkshake mashes at home…. Another option is to offer salty water first, before going to communal water trough. Have to start doing this at home (of course!). Here’s how to practice: bring a thirsty horse to the bucket and don’t let them drink out of their water trough until they drink out of the salty bucket. Use the same bucket for the salty water each time. Start really dilute and work up. Recommendation for Enduramax was 1 oz per gallon (2 tablespoons) for ending concentration, thus start at 1/4 or 1/2 this level then increase over time. You must be consistent about putting elytes in the food at home if that’s how you want to give them because the horse will start to refuse feed. Have to start building small and then build up over time (like the salty water). Get the horse to the point where they can tolerate a higher level of salt. At home can use just regular table salt (no iodine), don’t have to use electrolytes (because what makes the elytes taste salty is the NaCl in it, which is the taste aversion you are trying to overcome). However, make sure to test your horse with the ride elytes before the ride because it may taste a little different than the table salt and you don’t want anything weird to happen at the ride!!!! And that’s it for my notes!!!! I hope that you found a little something or a little tidbit in this information that helps you during your season. I think I’m going to experiment with salty water, and offering wet mashes in the trailer instead of hay in the trailer. And you bet I’ll be paying attention to hydration this upcoming season!!!! I didn’t realize how low levels of dehydration produces significant physiological/performance effects and I’ll be making sure that the water I offer at the trailer is in a container that promotes drinking. Back to paying attention in my animal welfare class. I have a couple more convention posts to put up: one more seminar to summarize, and then some product/vendor reviews. Really great write-ups, Mel! This dehydration one is super-fascinating to me because it’s something I’ve struggled with, off-and-on, over Mimi’s entire distance career and it’s what always got her into trouble: as well as she drank at home and during training rides, it was a hit-or-miss thing at rides. Even with the large muck bucket water buckets. But I really liked seeing actual numbers for electrolytes and how much is safe to give. I’ve definitely been well on the side of under-e’lyting, but better safer than sorry, I suppose. I’m on the fence about elyting. I think I’m most comfortable wtih the methods that allows the horse to drink out of the salty bucket, and then go to a regular bucket. I don’t like the syringe method. However, now that i know that no matter how much a horse drinks at a ride they are not replacing their fluid loss, I will be more proactive whatever I chose to do. A note about the whole “not replacing fluids” thing – humans do it to – even elite athletes that know better! So it’s not just with horses! I foolishly almost skipped this post. GREAT POST. I rarely have problems getting my mustang to drink (trail rides only-no endurance) as he is from NW Nevada. Never met a stream he didn’t like. Great post, I’m definitely bookmarking it to refer back to it. My wretched, wretched cow LIKES to get her mouth wet. I think I might try being cruel and letting her SEE the water trough but not wet her tongue for the first 10 miles or so, then see if she actually drinks some at the next stop. I’ve always heard to rinse the elyte residue out of their mouths with a syringe of water – I wonder if that practice also shuts down the thirst response? I might quit doing it. So Garlinghouse actually addressed exactly that (rinsing out the mouth). She said it probably doesn’t hurt, but that giving the horses syringes of water, having them drink out of your water bottle etc. probably isn’t helping. Although you might not want give elytes if you need to rinse afterwards right before a water trough. Melinda, What type of “milkshake mash did Susan refer to ? Beet pulp , rice bran ? Or did it matter ? Thanks these were great notes. I can’t remember for sure but maybe she said she liked a triple crown feed? I remember thinking that my Stable Mix by EGM was totally appropriate. I think any of the top ones – LMF, triple crown etc. that are relatively sugar/mollassas free with a base of beet pulp etc. were fine. I don’t think it was straight beet pulp. I don’t think from her website rice bran is something she would feed her endurance horses – at least not in the quantities that seemed to be referenced here. My guess would be beet pulp or a pellet that is beet pulp based (which makes a much better “milkshake” mash. Ugh – it was explained during the seminar in more detail than I wrote down – but I must admit I wasn’t paying much attention – I was frantically writing stuff down from the LAST slide she had up – so much good information! She went into a good amount of detail of WHERE fluid is stored in a horse and I think there was a specific compartment (ECF?) that was lower in older horses. The point being that they have less to lose than the younger horse. I’ll see if I can look up a reference to direct you too…. Supposedly older horses have less plasma volume. OK – added the paper about older horses/less fluid to the Mendeley group. And cool (but older paper) that discusses paste versus saline water eltye replacement for endurance horses. Still – I like what I hear about being able to do the elyte water rather than paste if possible! where can I view it??? Jonna – go the the Mendeley “journal club” link on the side bar and click on the title of the widget, or the title of the paper starting “age related…”. The paper encompasses 2 studies – the small second being where I think Garlinghouse got the older horse comment. If you still can’t see the link let me know…. Found it… wish it was more extensive..interesting point I noticed was that the older horses were “unfit”. That would certainly have an impact as well. I saw that too – but the younger horses were unfit too, which is how they made their comparison. It’s the only lit reference I could find – I’ll contact Susan Garlinghouse and see if she has a different reference, since she referred to it in her presentation. I was always a big believer in letting my horse graze throughout a race. I figured that if he didn’t drink, at least he was getting something from grazing. Now I’m wondering if that might keep him from drinking! Grazing keeps the mouth moist, and it does provide nutrition, but does not provide as much water. I wonder if providing nutrition thru the grazing balances out repressing the need to drink… I don’t like the idea of refusing to let him graze because I want him to drink later. Whatcha think? In my non-scientific opinion grass isn’t THAT high in moisture, and the elytes its consumes while eating forage/grass/food balances out/negates the risk. Here in CA, most of the time the grass is really dry, so it’s not something that would even grass my mind, except to worry about choke if my horse was really dehydrated and tearing up huge chunks of grass and shoveling it in her mouth. If I WAS worried about wet grass and the thirst mechanism, I probably wouldn’t let my horse graze on the stuff while waiting for the water trough – I’d let them graze afterwards. As long as my horse isn’t in trouble, I’d feel OK not letting them graze so that hydration was better, than letting them graze on an insignificant amount of grass that might raise my gut sounds from a B+ to an A-. If my horse wouldn’t graze after the water trough (this is my issue), I’d carry carrots or some other food treat to feed after the water trough. Funder did that at her last ride and it worked out well for her. 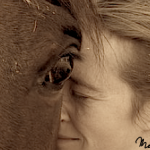 If my horse wanted to graze throughout the race, I’d let her (and I do) – I probably just wouldn’t let her right before a trough – does that make sense? Mel: I’m in the midwest, so we have GREEN grass out here! So quite a bit of nutrition in it, and more water than hay, choke not a problem. But you did say something I agree with — while waiting to drink I will for sure NOT let my horse graze. Or if I am getting close to approaching a known water source. That’s a simple terrific idea. Wow! Thank you for taking the time to post this. I didn’t get to go to the convention this year. What fabulous information! Older horses get dehydrated easier the same way people do. My Dad has problems when it first turns hot here (phx az). He frequently gets muscle cramps until he goes to Colorado for the summer. Horses are the same (not sure if the muscle cramps and trips to Colorado apply). Bottom line it’s part of the aging process. I think it has to do with the breakdown in the cellular elasticity mentioned earlier in this article. Thanks so much for posting this. Very interesting. Oh man, another great post still useful all these years later. Would like to share on FB with credit to you again Mel if I might? Also, did you remove the Mendeley link? Or it somewhere else? Would love to read further and share with my friends. You’re a WEALTH of awesome info!!! LOL you are making me blush! Of course you can share (and this goes in general for all of the posts here). You only need to ask my permission if you are republishing it (like a full text thing on a blog or something) :). I’m so glad someone is enjoying the back posts. I’m trying to be better about tagging posts like this one that are still valuable many years later. I’m going to add a link to it on the archive or publications page too.